This is from arrival at the first destination to departure at the end of the trip. (not including traveling from your home country, and/or traveling back home). The number of domestic and/or regional flights which are included in the trip price. Accommodation facilities on certain trips may vary. Some luxurious trips may have one (or more) nights off the beaten track, where we could spend the night in a home stay, or in a simple guesthouse so we can include a location we think well worth it. On the other hand, a trip rated as 'rough' might include few good hotels throughout its route. The overall accommodation rating refers to the norm across the entire lodging facilities used on a certain trip. Moreover, the rating definitions are obviously subjective, so treat them with appropriate caution. A trip that includes extensive camping, home stays and/or very basic local hotels. These trips are often conducted in remote regions, where travel-related infrastructure doesn’t exist. A trip that includes extensive stays in local hotels or unrated accommodation facilities. On this type of trip, the accommodation facilities will have a very basic range of services and the overall service might be rather poor. A trip that is mostly based on good hotels and usually goes to places where the travel-related infrastructure is well developed. At the end of extensive travel day, land in a great hotel, to make a great day into a great night. These trips are based on good 4-star hotels we have hand-picked to enhance your trip. Some of our top-of-the-range trips, we provide accommodation in hotels, the majority being 5-star or very good 4-star hotels. Sometimes they’re not rated but are nevertheless boutique hotels. If you're looking for a trip that provides both a great insight into the local culture and high level of comfort, then our luxurious trips are the ones for you! Any challenging physical activities optional. Easy walks and comfortable driving distances over paved roads or moderate dirt roads. Hikes or rides of 2 to 4 hours on some days. Easy physical activities. May include one to three longer driving days. May include full-day hikes or rides (4 to 6 hours) over moderate terrain and occasional steep trails, or long driving distances on rough roads. May include full-day hikes (up to 6 hours) or rides over challenging terrain, long driving distances over rough unpaved roads, or challenging weather conditions including extremes of temperature. Expedition-style camping or stays with local families. Includes full-day hikes or rides over mountainous terrain, or other strenuous physical activity requiring good physical fitness. Extremes of weather may include very hot and dry conditions or cold, snow and ice. Mongolia, a country of abandoned dirt roads, high mountains and vast lakes, invites you to join a unique mountain-biking expedition to explore one of the country’s most amazing regions, along Mongolia’s second highest mountain range, the Khangai Mountains. Whether you are an expert, looking for wild single treks, or an amateur looking forward to explore the country at a relaxed pace, this route offers it all. Join an expedition that combines the best of both worlds, a great biking trip together with an up-close encounter with the local nomads, and get to see parts of the country that can be revealed only when being explored on 2 wheels. Arrival in Ulaanbaatar, the Mongolian capital city. At 14:00 we meet our guide at the airport, and head to the city center. The short drive passes through the shanty town inhabited by those who were once nomads, but have neglected their traditional lifestyle in the hope of finding a little fortune in the city, which not too long ago has seen some rapid development. The urban landscape quickly changes into expansive shopping malls and brand new residential complexes, shifting again to the scenes of the city center, where modern high-rises are quickly built amidst soviet-era buildings. After checking into our hotel, and if time permits, we will have an orientation tour of the city ccenter through the central square. Right at the heart of the square we see the figure of D. Sukhbaatar, one of the heroes of the communist revolution of 1920’s, boldly raising his arm towards the statue of Chinggis Khan, the nation’s forefather whose name wasn’t allowed to be mentioned during the 70 year communist reign. We then visit the National History Museum, which holds a permanent exhibition on the different civilizations that have inhabited the territory of Mongolia from prehistoric times to the present. This exhibition includes a significant display of objects from the era of the Great Mongol Empire. From here we take a short walk to the drama theater where we attend an impressive folk concert, featuring some traditional Mongolian art forms. After a welcome dinner, we drive back to our hotel for a good night’s sleep. Today we drive back in time, to a place that recreates the lives of Mongolian nomads at the beginning of the 20th century. This was when Mongolia gained its independence from the Qing Dynasty and established itself as a reemerging nation under a living god-king. We shall attend a demonstration of how the nomads lived their lives during this era, and we shall see a stunning performance of Mongolian horsemanship. After lunch we continue our road trip. Built by Chinggis Khan about 800 years ago, Kharkhorin, better known as Karakorum, was famed throughout Asia as the capital of the Mongol Empire. Within the walls of this spectacular city kings were chosen, laws made and the fate of the next city to be conquered were determined. We will visit the ruins of the old city, the Erdene Zuu monastery and other historical monuments in the area. Overnight in a ger camp by the Orkhon River. After breakfast, and a short driving out of Kharkhorin, our first stop will be at Tuvkhon Monastery, established during the 1650’s by Zanabazar, one of Mongolia’s most respected religious leaders. The monastery’s wooden buildings are integrated with a natural system of caves perched hear a hilltop, from which you have beautiful views of the Orkhon Valley and the surrounding pine forests. With its unique natural features, it was a perfect location for the great religious leader to meditate. After lunch we will unpack the bikes, and start riding. Riding our bikes along the river’s banks throughout the vast Mongolian steppes, here there is a great variety of birds of prey, including eagles and falcons, constantly on the watch for a meal. In the evening we reach the Orkhon Valley, where we make camp for the night. Overnight in a tent. Leaving our camp, we ride the beautiful volcanic canyon through which the Orkhon River flows. Here we will take an easy hike along the canyon floor, and end up at the pool at the bottom of the Red Waterfall. For the brave at heart, a cool swim awaits! From here we ride towards the eastern slopes and deeper into the Khangai Mountain Range to camp for the night. Overnight camping in tents. Today we ride into the Khangai Nuruu, Mongolia’s second largest mountain range, to the Eight Lakes national park, which lies 2800 meters above sea level. As its name suggests, the national park contains many lakes scattered over two big valleys. Very few families inhabit the area, and it is a perfect secluded spot single track riding. Overnight in tents. After breakfast, we will depart from the picturesque Shiret Lake, crossing the Eight Lakes NP from south to north. We will stop for a lunch on the shores of Duruu Lake, before leaving the NP, and heading downwards to the White Stallion Valley, characterized by stunning rock formations on both sides of the narrow valley. We then continue to cross a small ridge, all the way to the stunning Uliatsy River, where we will camp for the night. Overnight in tents. Keep on biking northward, we leave the slopes of the Khangai Mountains, and heading to an area known by the Mongolians as the ‘Paradise of the Horse Herders’ for its prosperous grazes and its natural beauty. We will ride along the Orkhon River, and then up one of its tribute, the Shirlag River, where we will camp for the night. Overnight in Tents. A demanding but rewarding day of riding awaits us. We will ride through the narrow valley of Shirlag River, and after strenuous climb, a wild single track would take us through a land of mysterious rock formations. At late afternoon, we enjoy a well disserved treat, the Hot Springs of Tsenkher, where water flows out of the ground at 82° C, and where we can enjoy a relaxing soak. Overnight in a ger camp. We begin the day with a ride to Tsetserleg, the provincial capital of Arkhangai. We stop for our last picnic lunch by a beautiful stream, and then pack the bike. We then go on a few hours’ drive eastwards. In the late afternoon we arrive at Hustaiin Nuruu Strictly Protected Area (SPA). The SPA was established as part of a unique project to reintroduce the world’s last surviving wild horses to their natural environment. On the brink of extinction during the 20th century, the very few takhi, or Przewalski’s horse, that remained were kept in European zoos. This graceful steppe horse was returned to Mongolia, and today, thanks to this special project, two herds again roam the Mongolian steppes. Overnight in a ger camp. 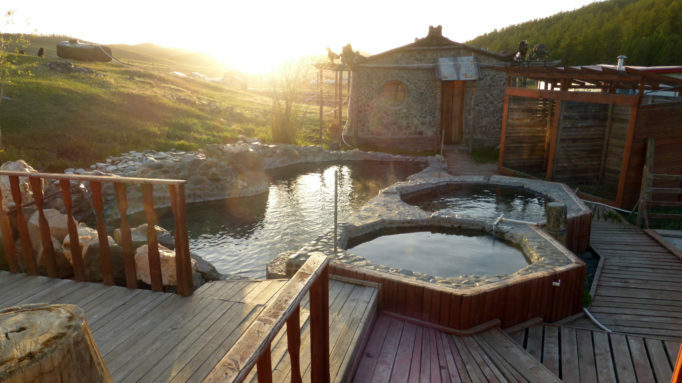 We take the 2 hours’ drive from Hustaiin Nuruu SPA back to the Mongolian Capital. We begin exploring the city with a few hours exploring the Black Market. This huge market contains every single item a Mongolian might need, whether they are nomads or urban apartment dwellers. Goods brought from all corners of Mongolia are here for sale. A visit to the market is a colorful experience which gives the visitor an insight to the everyday life of the people of Ulaanbaatar. After lunch we visit the National History Museum, which holds a permanent exhibition on the different civilizations that have inhabited the territory of Mongolia from prehistoric times to the present, including a significant display of objects from the era of the Great Mongol Empire. If time permit, we shall also pay a quick visit to the Natural History Museum, where a permanent exhibition of the flora and fauna of Mongolia is displayed, including excellent examples of dinosaur skeletons excavated from the Gobi Desert. In the evening we will enjoy a farewell dinner, followed with a trip to the top of the Zaisan Hill, to enjoy the view of the city at night. Overnight in 4-star hotel. After breakfast at the hotel, transfer to the airport for your international departing flight. Prices are based on twin share occupancy. Applicable only for travel groups of 4 people or more booking their trip together. The discounted price is the price for 2 people (below) less the discount. Mongolian Ways Ltd. reserves the right to change tour prices and programs due to changes in flight schedule, changes in airfares, and other local circumstances. Note: The listed hotels are tentative. Final hotel list shall be confirmed upon placing a booking and paying a deposit.